September 7, 2017 "Instructions For Forms 1094-c And 1095-c" contain the latest filing requirements for the IRS-issued Form 1095-c. Download your copy of the instructions by clicking the link below. IRS Form 1095-c is tax form released and collected by the Internal Revenue Service of the United States. employer shared responsibility provisions under section 4980H. employees for the premium tax credit. 2016. No section 4980H transition relief is available for 2017. “Reserved”; and the entry rows in Part III, column (e) are shaded. months that they are covered under the plan. of the ALE Member for any month of the calendar year. 2014-13 I.R.B. 855, at www.irs.gov/irb/2014-13_IRB/ar09.html. Form 1095-C (or a substitute form) to the employee. information reporting requirements, visit IRS.gov. each separate employer within the group is an ALE Member. ALE Member has fewer than 50 full-time employees of its own). hires and employees in Limited Non-Assessment Periods. See Definitions, later, for key terms used in these instructions. considered a full-time employee during that period. individual identified on line 1 has an SSN. develop them yourself or buy them from a private printer. must be printed in landscape format. employee for any month of the calendar year. for each employee for whom the ALE Member is required to file. employees, as applicable, of the ALE Member. Member need not complete Part II, lines 15 and 16.
form completed as indicated in the instructions for line 19, later. 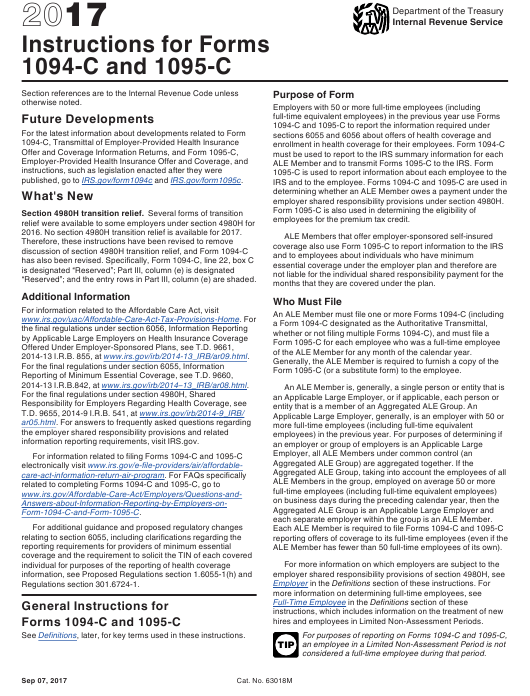 should not complete Form 1095-C, Part III, for those employees. instructions for line 19, later. report coverage for those individuals and other family members. should be filed for an Aggregated ALE Group. employment during a previous year. 1094-B and 1095-B, see the instructions for those forms. full-time employees reported for those months on Form 1094-C.
is any day that is not a Saturday, Sunday, or legal holiday. employer-level data for the School District. on when Form 1095-C must be furnished. file. No signature or explanation is required for the extension. B, for more information on filing online or electronically. service for Employer A and 30 hours of service for Employer B.
for Employer B and no hours of service for Employer A.
original returns and corrected returns. consecutively, and place Form 1094-C in package number one. that conform to the official form and the specifications in Pub. filed with the IRS must be printed in landscape format. for at least three years, from the due date of the returns. Do not use this box on Form 1095-C.
see section 7.1 of Pub. 5165.
error is discovered. File the corrected returns as follows. electronically even though you are filing fewer than 250 returns. date of the returns, but no later than the due date of the return. with the corrected Authoritative Transmittal. copy of it to the service center where you file your paper returns. Keep the waiver for your records only. reasonable cause criteria. For additional information, see Pub. instructions for filing corrected returns.